POTSDAM, N.Y. - The No. 5/5 Boston College women's hockey team saw its season come to an end on Saturday, falling to No. 4/4 Clarkson in overtime of the NCAA Tournament quarterfinal at Cheel Arena. Elizabeth Giguere's game-winner with 5:22 to play in the first overtime gave Clarkson a 2-1 win and a spot in the Frozen Four. The game opened evenly between the two teams but Daryl Watts broke the deadlock with 6:36 to play in the period. The Eagles kept the pressure up, outshooting the Golden Knights 14-6 in the frame. Maddy McArthur was tested early in the middle frame, with BC sent to the box twice in the first 10 minutes, but the freshman and the defense weathered the storm to enter the second intermission still up by a score. Josiane Pozzebon, though, would tie it with just over three minutes remaining in regulation to send BC to its second consecutive overtime tilt. Both teams had great looks in the first extra frame but it would be Giguere's 26th tally of the season with 5:22 on the clock that ended it. McArthur finished with 28 saves for BC while Kassidy Sauve had 35 for Clarkson. BC had the 36-30 edge in shots on goal. BC was 0-for-1 on the power play while Clarkson was 0-for-3. 1st, 13:24 | 1-0, BC GOAL: Watts collected the puck near the hashmarks and worked it up the boards before skating into the slot. Serena Sommerfield's slap shot then deflected off of Watts on her way through and past Sauve. 3rd, 16:57 | 1-1, CU GOAL: Pozzebon entered on the right side and carried the puck to the dot before cutting in and in between some Eagles to fire a shot that squeaked under McArthur's blocker. OT, 14:38 | 1-2, CU GOAL: After a shot lead to some traffic in front and a BC clear deflected back into the crease, Giguere got her stick to the puck and pushed it across the goal line. - Lindsay Agnew recorded at least one shot on goal in every BC contest this season. - The Eagles outshot the opponent in the final 28 games of the season. - Ryan Little and Kali Flanagan each played in their 157th career game today, tied for the most in program history. - Watts ends the season on a seven-game point streak. 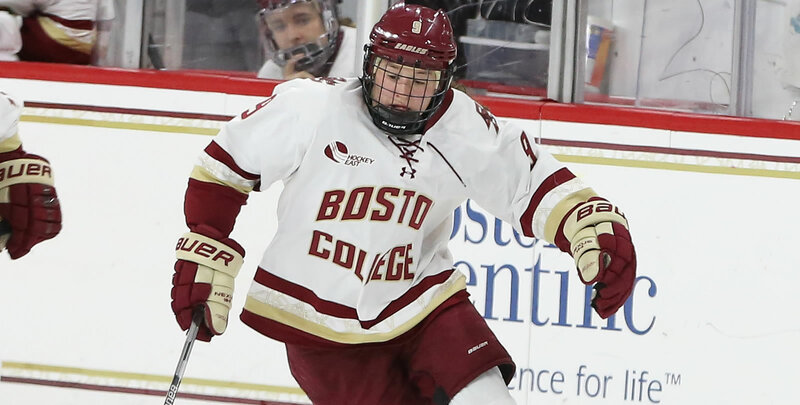 - Saturday's quarterfinal was the 16th meeting between the two programs ... BC still leads the all-time series at 7-5-3 ... Katie Crowley is 5-3-5 against the Golden Knights. - This was the fourth time that the teams met in the NCAA Tournament and the third meeting in the quarterfinals ... BC is 2-2-0 against Clarkson in the national tournament with a 1-2 mark in the quarterfinal round and a 1-0 mark in the semifinal ... BC is 2-3-1 against the Golden Knights at Cheel Arena. - BC made its ninth consecutive NCAA Tournament appearance and the program's 11th overall.